For this post, I thought I'd go all Throwback Thursday on you and recant a tale of terror annd hilarity. But before we time travel to last year, let me show you what's been going on this year at the Lemmon household. Also, we carve pumpkins every year. Only, I didn't really get a good photo of ours because we were PLANNING on lighting them TONIGHT for Trick or Treat. Now for the throwback tale...may it ever haunt you. MWAH HA HA!!! My house was built in 1957. My grandparents bought it after the last brick was laid, paid it off 30-some odd years later, and moved to Florida. My dad bought it and lived here for a good clip before selling it to Mr. Lemmony and me. Our first home. And my family's home. Because it's an old house that's been only in my family, it has its quirks. Interesting wiring courtesy of my handyman grandfather, floorboards that practically play a tune when you step on them, and a doorbell at the back door. Maybe it made sense then, but now? Not so much. Our house is surrounded by a fence, a creek, trees and a detached garage. We even have a locked gate thanks to a couple of punks who decided to walk into our garage one dark and stormy night and help themselves to our air compressor, socket wrench set, and a handful of other tools. I'm telling you this so you'll understand how odd it was when the hubs and I were *almost* asleep Friday night and the back doorbell rang. "What was that?" I asked, bolting upright. At that time I had two theories. Either we had a wiring problem, or my late grandmother (who passed this year) had come back home. "I rang it earlier," Mr. Lemmony said, throwing off the covers. "Maybe it stuck." I quirked my mouth in a show of doubt. I'd buy my haunted-by-grandma story first. He entered the kitchen and heard a scratching sound at the door, at this point suspecting an escaped baboon from the zoo. I mean, really, that button is 3 1/2 feet from the ground. And up three steps. He called the dog, figuring Bailey could scout out whatever monster was on the porch before he did. Sorry, B, but in the event of a zombie apocalypse, you're the canary in the coal mine. A moment later, I hear relieved laughter. "You've got to see this," he called. I swung my legs out of bed and scampered to the kitchen. 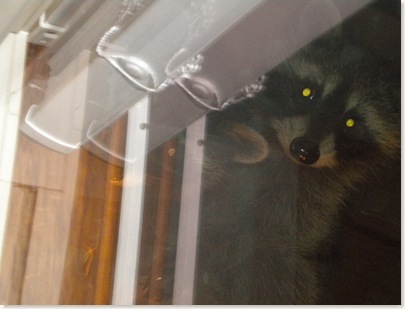 He had, indeed found masked bandits on our porch! Our view from the kitchen window. BABY Raccoons, people! Three of them! "Pardon*, we don't usually ring the bell, but we're having trouble locating your meat scraps."